Eli’s work does a wonderful job of capturing the often whimsical essence of fortean phenomena. Fortean artist Eli Wolff has been a video game artist for 20 years, but it wasn’t until a decade ago that he decided to pick up a paintbrush and create the wonderfully whimsical works of paranormal pop culture displayed in our art portal. "I have always been a big fan of cartoons, comic books, video games and pop culture in general, even cereal box cartoon mascots," he told us. "So when I discovered there is a genre of fine art called 'pop surrealism' that is full of pop culture icons, I really loved it and that became my style of choice." Eli’s love of paranormal media combined with his sense of humor are evident in his portrayal of the subjects in his paintings. "I love horror and sci-fi movies, and shows like The X-files," Eli explained. "I'll paint anything that I find interesting and I like to put my own humorous twist on the subject matter. The idea of a monster like Bigfoot actually just wanting to brew beer and party with alien visitors is very fun to me, so that's what I go with." How do we get an invite to this party? 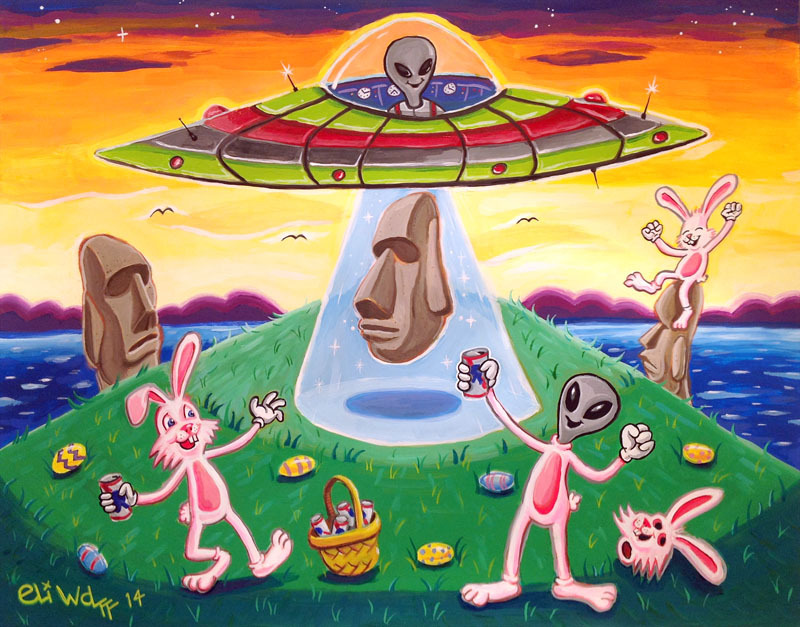 But if you notice that a large percentage of Eli’s paintings feature aliens, that’s no accident. "My number one favorite paranormal subject is UFOs and alien visitors," he said. "I'm certain we are not the only life forms in the universe, and I'd love to know we are already in contact with aliens secretly. I have not been to Roswell yet, but would love to visit that area soon." While Eli hasn’t had any alien encounters yet, he does live in a haunted house. "I'm pretty certain my house is haunted," he said. "There have been several times unexplained events have happened." "The house is over 100 years old," Eli continued. "A few examples are: one time in the middle of the night my wife and I both woke up to the sound of a metal object clinking in what sounded like a bowl (imagine dropping a spoon in an empty bowl). No one else was home; another time we were sitting on the couch talking about how to deal with ghosts and I mentioned 'What if the ghost was an atheist or satanist when it was alive? ', and as soon as I said that, we heard a loud crash sound from my office. I went in and found a painting of Cthulhu had fallen off the wall. It had been hanging there for months with no problem...so that was creepy." This painting by Eli illustrates how many fortean phenomena sit at the same metaphorical table. When it comes to advice, Eli emphasizes the importance of keeping busy. "My advice to any artists is to create something every day," he said. "Even if it's just doodles for 30 minutes before bed and you're tired. Some of my best ideas come from just drawing random monster faces. The more I paint and create, the more ideas I get." You can see Eli's work around the Seattle area in coffee shops, breweries, cafes, and galleries; including the Phantom Realms and Black Lab galleries, The Uncommon Cottage, and The Nearsighted Narwhal. Also make sure to visit his website and Etsy page, find him on Facebook and Instagram, and of course check out his entry in our art portal.